Chevron CEO John Watson seems nervous about the Ecuadorian villagers who won a $9.5 billion judgment against his company for dumping toxic waste into the rainforest. Apparently Watson is so nervous that he and Chevron General Counsel R. Hewitt Pate are making elaborate plans to move the company’s 2014 annual meeting from company headquarters near San Francisco to a rented petroleum museum in Midland, in the hinterlands of west Texas and a five-hour drive from the nearest metropolitan area of Dallas-Ft. Worth. It is worth noting that Watson and Pate are making these elaborate plans – which will include flying in top management and Board members on a corporate jet -- despite the company’s self-proclaimed “victory” in March in a New York civil fraud case against the villagers and their lawyers. As we recount here, the verdict is nothing more than a Pyrrhic victory resulting from the obvious biases of an activist American judge who tried to overrule Ecuador's Supreme Court on questions of Ecuadorian law. We predict the decision will not survive appeal and in any event will either backfire against Chevron in enforcement courts abroad or be ignored. Why are Watson and Pate are going to such great lengths to find a friendly location? The deaths of many Ecuadorians from cancer are happening on their watch, and interest is running on the judgment to the tune of several million dollars per month as Chevron faces asset seizures in Canada, Brazil, and Argentina. The duo so bungled the company’s legal strategy in Ecuador – which included unethical and illegal efforts to sabotage the proceedings in the very forum where Chevron insisted the trial be held -- that Chevron now faces what is probably the largest court judgment in the history of environmental law. For their work as the ultimate corporate insiders, Watson last year took home $24 million while Pate deposited around $6 million. Watson, a hot-tempered man who in 2010 had five dissident shareholders forcibly removed and arrested at an annual meeting, might believe that few of his critics will show up in Midland given that there are scant commercial flights to the town’s small airport. For the last decade, Chevron’s annual meeting near San Francisco invariably attracted a large protest involving Ecuadorian villagers who would enter via proxies and confront Watson directly. Midland is a town of 120,000 that was founded as a train depo at the midway point between Forth Worth and El Paso. Now located near several major oil fields, the town has an industry-funded petroleum museum which Chevron will rent for its meeting and provide funds for to renovate its exhibit space. 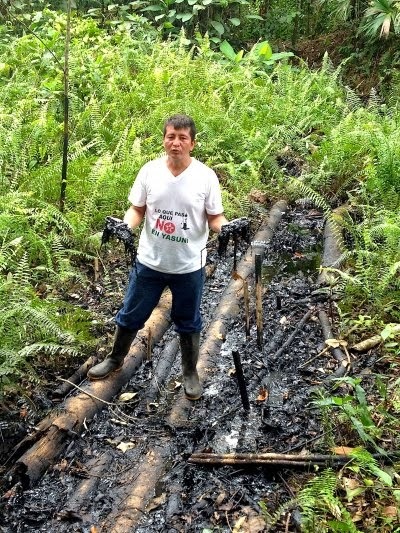 · Enforcement actions filed by the Ecuadorian villagers targeting billions of dollars of Chevron assets are advancing in Canada, Brazil, and Argentina. Last week, Canada’s Supreme Court said it would hear a narrow Chevron technical appeal on November 7. If the court rejects Chevron’s appeal, as is expected, there will be a quick trial to determine whether the villagers can seize some of Chevron’s $15 billion worth of assets in the country to pay for the entirety of their judgment. · Chevron shareholders are voting on three resolutions that criticize Watson and his team for their mishandling of the Ecuador litigation. One resolution takes direct aim at Watson by trying to split his dual roles of CEO and Chairman, long considered an outdated corporate governance practice. Two years ago, that resolution received a whopping 38% favorable vote from all Chevron shares. · Another shareholder resolution that cites the Ecuador liability calls for the company to appoint a board member with environmental expertise. Another would make it easier for shareholders to call special meetings. · Among the prominent Chevron shareholders backing the shareholder resolutions related to Ecuador are the New York State Common Retirement Fund, Trillium Asset Management, Amnesty International, the Unitarian Universalist Association, and the Swedish insurer Folksam, which has $32 billion under management. The New York fund owns about $800 million of Chevron stock. · Watson also must face the fact that several high-profile celebrities have sided with the villagers and are urging the company to pay for a clean-up in Ecuador. Among them are Sting, Trudie Styler, Roger Waters, Danny Glover, Mia Farrow, Brad Pitt, Jada Pinkett Smith, and Cher. At the recent 25th anniversary celebration of the founding of Sting and Trudie’s Rainforest Foundation, Chevron’s Ecuador contamination was messaged throughout an event that featured performances by Paul Simon, James Taylor, Dionne Warwick, and Renee Fleming. · In the meantime, Ecuador President Rafael Correa has launched a global diplomatic offensive against Chevron to force it to comply with a unanimous ruling of Ecuador’s Supreme Court that it pay for a clean-up of the rainforest. And just last week, communities from five countries called for a boycott of all Chevron products to take place on May 21 of this year – an action that could spread around the world and become permanent, according to observers. We tracked down our friend Chris Gowen, a professor of ethics at the Washington College of Law and a member of the trial team defending the villagers in the oil giant’s retaliatory RICO case. We asked him what it means for Watson to move the annual meeting to a place like Midland. A director at the environmental group Amazon Watch, which has organized several protests against Chevron over its refusal to meet its legal obligations in Ecuador, was more blunt. “Watson is squandering shareholder resources and leaving a huge carbon footprint by flying on a corporate jet to the hinterlands to avoid being confronted about his disastrous policies that violate human rights, most notably in Ecuador,” said Paul Paz y Miño, Online Director with the advocacy group. It is not surprising that Watson would prefer to conduct the meeting in Midland given his unflattering history of grappling with his own shareholders and critics. When challenged publicly, he often looks more like a fool than a skilled corporate executive. In 2010, during his first annual meeting as CEO and Chairman, Watson famously cut off the microphone when villagers from Ecuador’s rainforest tried to confront him with evidence of the company’s environmental crimes in their home country. He later became so infuriated that he had the Houston police arrest five well-known critics of the company, including Han Shan (a U.S. spokesperson for the villagers) and Antonia Juhasz, the author of The True Cost of Chevron documenting the company’s environmental abuses around the world. Chevron also has a long history of trying to deny the Free Speech rights of its many critics. Just two weeks ago, the company booted Paz y Miño from a Chevron-sponsored event to promote energy sustainability hosted by the Oakland Metropolitan Chamber of Commerce. The company also started its own newspaper and has tried to fund friendly political candidates in the nearby town of Richmond, where Chevron was found to have committed criminal violations at a local refinery that caused a spate of health problems. Watson also has been under criticism for his conflicts of interest on the Ecuador matter. Watson was the Chevron executive who engineered the company’s takeover of Texaco (which operated in Ecuador from 1964 to 1992), apparently without adequately vetting it for its liability despite the pending litigation. In the last two years alone, Watson’s personal compensation was far higher than the total amount Chevron claimed to have spent in the mid 1990s engaging in a remediation of its environmental problems in Ecuador, which the court there found to be fraudulent. Watson’s yearly compensation is roughly the equivalent of the combined annual incomes of all 30,000 rainforest residents who originally sued the company. Several reports (see here and here) by a Canadian securities lawyer demonstrate how Watson failed to adequately disclose the Ecuador risk to the public markets, leading to calls by shareholders and a U.S. Congresswoman for an SEC investigation of the company. Expect Watson's problems with shareholder disclosure to be another major issue at the Midland meeting. When powerful corporate executives go to great lengths to duck the little people, the move often backfires. Driving five hours from Dallas to Midland is not that great a sacrifice for a villager whose life has been threatened by Chevron's scorched-earth litigation strategy. And when shareholders arrive in Midland, they might have something to say about the expenditure of company funds for Watson and his entourage to travel in high luxury to a remote Texas town. Watson might be hoping for a calm meeting. We predict a showdown in Midland. Chevron operated in Ecuador under the Texaco brand from 1964 to 1992. By its own admission, it dumped billions of gallons of toxic waste water into the rainforest, poisoning an area the size of Rhode Island and leaving behind more than 900 toxic waste pits that still contaminate soils and groundwater. The long-suffering indigenous and farmer communities in Ecuador originally filed their claims in a New York federal court in 1993, but Chevron successfully fought to have the matter shifted to Ecuador where it promised to abide by any adverse judgment. Chevron filed 14 sworn affidavits praising Ecuador’s court system. Once the Ecuador trial began in 2003 and evidence against Chevron mounted, the company shifted gears and began to attack Ecuador’s courts and the lawyers who represented the villagers. Two Ecuadorian appellate courts – including Ecuador’s highest court, the National Court of Justice -- have unanimously affirmed the trial court decision against the company, which was based on eight years of litigation, 220,000 pages of evidence, and 105 technical reports. The trial court also imposed a punitive penalty after Chevron lawyers threatened judges with jail time and tried to sabotage the proceedings by filing duplicative motions, including 39 in one 50-minute period. As part of its scorched-earth retaliation campaign, Chevron sued five different lawyers who have represented the Ecuadorian communities, three funders of the lawsuit, the scientific consultancy that advised the legal team, and all 47 rainforest villagers named on the lawsuit. The company named numerous other environmental advocacy groups and individuals as "non-party co-conspirators" (a public relations term with no legal effect) in an attempt to intimidate people into abandoning the cause of the rainforest communities, said Paz y Miño of Amazon Watch. For evidence of Chevron’s long-term strategy to demonize the Ecuadorian communities and their lawyers, see this internal memo from the company’s public relations consultant, Sam Singer. Singer has been accused of secretly paying bloggers to parrot Chevron’s talking points without disclosing Chevron’s role. For a letter signed by 43 U.S. civil advocacy groups criticizing Chevron for targeting its critics, see here. For background on Chevron’s retaliatory RICO case, see this summary document and these legal petitions. Once ejected, I immediately called the office of Oakland's mayor Jean Quan. The mayor had been a speaker at the conference less than an hour before the incident. Her office did reach out to the OMCC on my behalf, but they were "too busy" to answer the repeated calls. Perhaps they were on the other line with Chevron at the time. Security guards forcibly removed Paul Paz y Miño, an employee of the environmental group Amazon Watch, from a Chevron-sponsored event today in Oakland because he was carrying flyers that he said he had planned to distribute outside the building after the program. 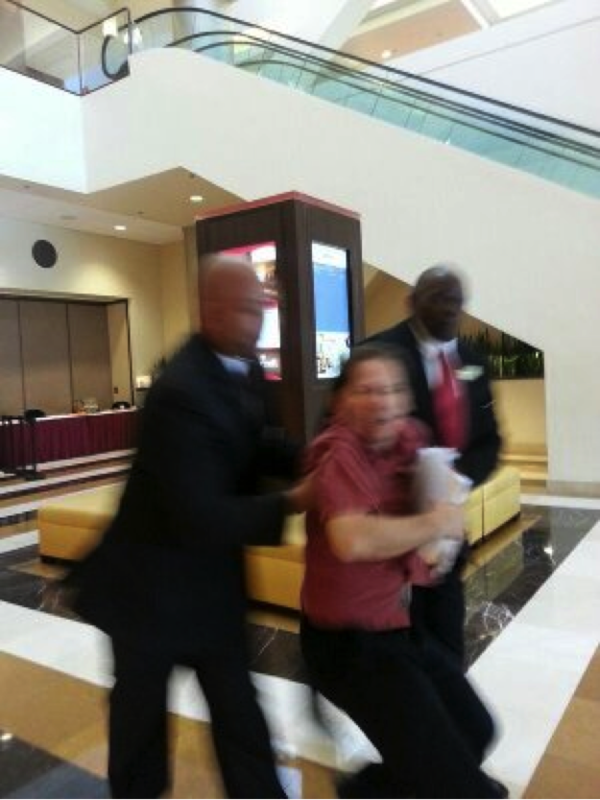 When Paz y Miño, who had paid $75 for a ticket to the public event, refused to leave, guards forcibly removed him. Paz y Miño had brought along numerous copies of a handout that mocked the Richmond Standard, an online “newspaper” that is operated by Chevron’s public relations firm and covers news in the city of Richmond where Chevron operates a large refinery. The publication has been criticized for being little more than a promotional newsletter for the multinational corporation, which has been widely criticized for a refinery explosion in 2012 that sent 15,000 people to the hospital complaining of respiratory problems. Chevron later pleaded guilty to six misdemeanor criminal charges and paid $2 million in fines related to the explosion. Paz y Miño, the guards said that “Amazon Watch was not welcomed at the event.” When Paz y Miño refused to leave, three security guards physically escorted him from the building. Paz y Miño scoffed at the idea that he had any intention of being disruptive. “There was absolutely nothing that I did, or was there anything in our social media, that suggested Amazon Watch intended to be disruptive,” Paz y Miño said, adding that he has yet to receive reimbursement for his ticket. The following article is by EarthRights International (ERI) staff attorney Marissa Vahlsing, cross-posted from ERI's blog where it was originally posted April 15, 2014. Donald had never left Ecuador before; but he decided to come to New York to speak truth to power. When he arrived, he learned that his truth had had little place. What is necessary then - necessary for the powerful to retain power, necessary for those who run the global economy to remain in control – becomes the rule of world. Other truths, like Donald’s, become unnecessary. 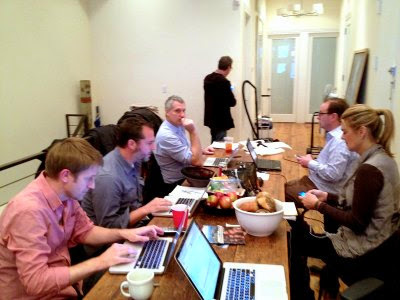 That night our team stayed awake well into the morning hours – trying to find Donald a lawyer. The next day, I watched as Donald got into a black car with his new lawyer, a Chevron lawyer, and a digital forensic technician hired by Chevron. Donald was gone for nearly ten hours, and when he came back, he was in tears. We sat down to write a declaration together to be read in open court the next day – to express the humiliation, invasion of privacy and loss of dignity that Donald had felt. When we tried to read the declaration in open court, we were told that Chevron would seek a bench warrant which could put Donald in jail. Some weeks ago I was down in Lago Agrio with Donald, walking out upon the pits and wells left by Texaco (now Chevron) after their nearly 30 years of operations in the Oriente region. I watched as Donald showed me how pits that were supposedly “remediated” still contain thick dried black crude within a few feet of the soil. “It’s a lie,” he says as he runs the dirt through water and the water takes on the thick black sheen of crude. But a necessary lie. During the trial, Chevron could never really deny the truth: that the contamination in the Oriente is real. This was so regardless of whether there was any merit to their RICO allegations. Thousands of miles away, courts on several continents are being asked to decide what happened in the Oriente and who is to blame. They are being asked to draw lines between advocacy and extortion, between asserting rights and participating in a conspiracy. As Judge Kaplan's opinion faces scrutiny in a court of appeals and other courts consider Chevron's tactics and responsibility, I hope that wisdom will not come too late.